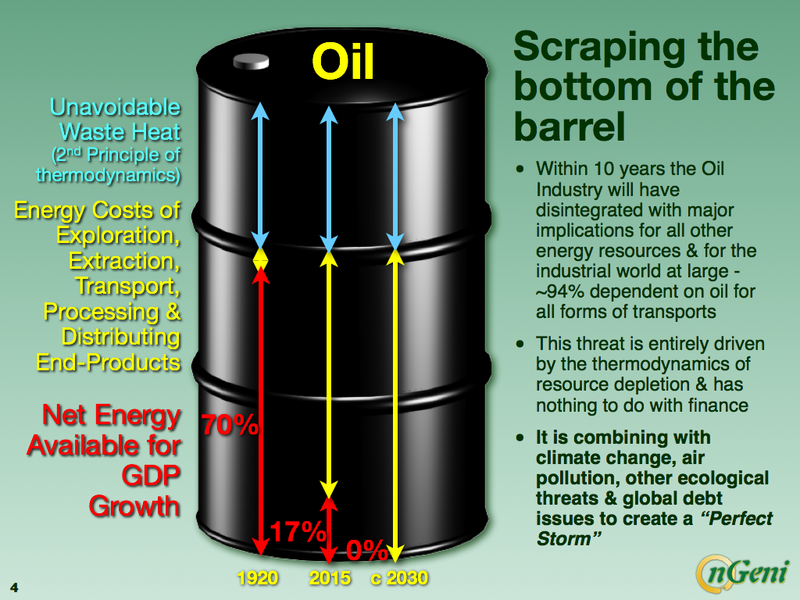 Please note: we don’t wish to deny that oil depletion has its own dynamics, but in our view those dynamics will be hugely affected by the financial crisis that is looming big and will strike first. A crisis that, by the way, will affect not just oil and gas, but solar and wind just as much. You can get only as much ‘alternative’ energy as you can pay for, and that is before we even mention solar and wind’s EROEI (Energy Return On Energy Investment). What the world needs to do, but we very much doubt it will voluntarily, is not to look for other forms of energy to replace oil and gas, but to look for ways to use much less energy (90% or so) while still maintaining societies that function as best they can. We doubt this because man is no more made to volunteer for downsizing than any other species. The interview below with Louis Arnoux by the SRSrocco Report, combined with an article Louis wrote in July on the site of our old friend Ugo Bardi (is Florence really 6 years ago already? ), is an excellent opportunity to catch up on energy issues. The discussion of energy relative to finance will no doubt continue, and Louis doesn’t seem to have the exact same view as us, but that’s fine, or at least it shouldn’t deter us from listening. 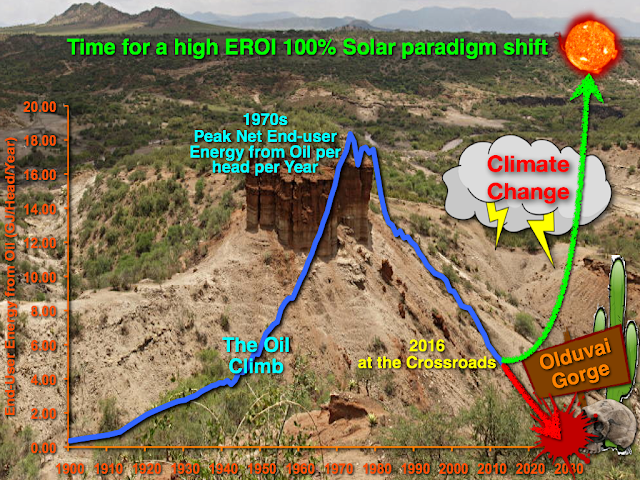 This graph from his work, for instance, contains a great depiction of what EROEI really means, and how it works out, and that is important to know. And yes, we are aware of the contradiction between the provocative title of this post (borrowed from SRSrocco Report) and our own view that it’s not energy that will bring the economy down; the internal dynamics of finance don’t need any help on their way towards crashing the system. But it’s a great title nonetheless. First, here’s the SRSrocco Report interview, below it you’ll find the article. Note: this is part 1, links to parts 2 and 3 are provided. This three-part post was inspired by Ugo’s recent post concerning “Will Renewables Ever ReplaceFossils?” and recent discussions within Ugo’s discussion group on how is it that “Economists still don’t get it”? It integrates also numerous discussion and exchanges I have had with colleagues and business partners over the last three years. In his recent post, Ugo contrasted the views of the Doomstead Diner‘s readers with that of energy experts regarding the feasibility of replacing fossil fuels within a reasonable timeframe. In my view, the Doomstead’s guests had a much better sense of the situation than the “experts” in Ugo’s survey. To be blunt, along current prevailing lines we are not going to make it. I am not just referring here to “business-as-usual” (BAU) parties holding for dear life onto fossil fuels and nukes. I also include all current efforts at implementing alternatives and combating CC. Here is why. If we had a whole century ahead of us to transition, it would be comparatively easy. Unfortunately, we no longer have that leisure since the second key challenge is the remaining timeframe for whole system replacement. What most people miss is that the rapid end of the Oil Age began in 2012 and will be over within some 10 years. To the best of my knowledge, the most advanced material in this matter is the thermodynamic analysis of the oil industry taken as a whole system (OI) produced by The Hill’s Group (THG) over the last two years or so (https://www.thehillsgroup.org). THG are seasoned US oil industry engineers led by B.W. Hill. I find its analysis elegant and rock hard. For example, one of its outputs concerns oil prices. Over a 56 year time period, its correlation factor with historical data is 0.995. In consequence, they began to warn in 2013 about the oil price crash that began late 2014 (see: https://www.thehillsgroup.org/depletion2_022.htm). In what follows I rely on THG’s report and my own work. At present, under the prevailing paradigm, there is no known way to exit from the Perfect Storm within the emerging time constraint (available time has shrunk by one order of magnitude, from 100 to 10 years). This is where I think that Doomstead Diner’s readers are guessing right. Many readers are no doubt familiar with the so-called “Red Queen” effect illustrated in Figure 2 – to have to run fast to stay put, and even faster to be able to move forward. The OI is fully caught in it. Bio: Dr Louis Arnoux is a scientist, engineer and entrepreneur committed to the development of sustainable ways of living and doing business. “Since 2007, the real disposal income of pensioners has risen by almost 10%. Those over the age of 65 have harvested fully two-thirds of that £2.7tn increase in national wealth. By contrast, since 2007, working-age households with children have achieved income gains of only about 3%, while the incomes of those without children have fallen by 3%,” he said. This can only go horribly wrong, there is no other possible outcome, but it’s a topic politicians either don’t understand or don’t want to touch. Which is why I wrote Basic Income in The Time of Crisis a month ago. There is not much time left. Older people have saddled the younger generation with an excessive bill for state pensions while grabbing an ever-greater share of NHS spending, according to a report that calls for intergenerational rebalancing. The report from the Intergenerational Foundation (IF) said spending promises on state and public sector pensions are “overwhelming young people’s prospects”. The thinktank is calling on the prime minister, Theresa May, to abandon triple lock protection, which promises that the state pension will rise each year by whatever is highest out of inflation measured by the consumer price index, average earnings growth or 2.5%. The former pensions minister Ros Altmann has called for the triple lock to be scrapped. The Department for Work and Pensions has declined to rule out a review of the “totemic” policy in the coming months. The report estimates that workers are paying £2,846 a year each to cover the cost of paying state pensions. Public sector pension liabilities, for schemes such as retired civil servants, have risen by 12% to nearly £44,000 per worker, with total liabilities at £1.4tn, it added. Angus Hanton, the co-founder of IF, said: “Public sector pensions represent one of the largest unfunded burdens for younger taxpayers, who will not retire at the same age, or on the same terms, while having to contribute more to their own pensions. “Increasing retirement ages and moving to career average pensions will not be enough to stall the pension burden avalanche that is bearing down on the young. Auto-enrolment is an apparent success, except that it leaves young people paying twice, saving for their own pensions while also paying for the pensions of older generations through taxation.” But charity Age UK said the vast majority of pensioners have contributed throughout their life to the state pension, which remains lower than the amount paid in many other western countries. Caroline Abrahams, the charity director at Age UK, pointed out that 1.6 million older people live in poverty in the UK. “A strong pensions system that provides a decent quality of life in retirement is central to a civilised society and in the best interests of us all,” she said. Britain’s millennials, already suffering for the economic mistakes of the past, now face the prospect of having to pay for the country’s future. Pension-fund liabilities in the U.K. increased to a record £1 trillion ($1.3 trillion) after the Bank of England’s interest-rate cut this month, hurt by quantitative easing and razor-thin yields. It’s Britain’s version of what Duquesne Chairman Stanley Druckenmiller calls “Generational Theft” in the U.S. Plunging bond yields have caused pension liabilities to balloon and it could get even worse because the BOE will probably reduce interest rates further this year. Deficits for defined-benefit-pension funds already rose by more than 40% in the two months through July, following the vote to leave the EU and the central bank’s subsequent decision to increase quantitative easing, according to consulting firm Mercer. “The Bank of England clearly believes that the effect on our pension system is acceptable long-term collateral damage” to prevent a short-term recession, said David Blake, professor of pension economics at London’s Cass Business School. Younger workers will “have to save more – which they appear reluctant to do – or be prepared to work much longer.” The increased bond-purchase program has had a relatively limited impact on pension deficits, according to the minutes of the BOE’s Monetary Policy Committee meeting on Aug. 3. While the fund managers have to move into riskier assets, that helps to support the economy, Governor Mark Carney said Aug. 4. “That makes it less likely that we will have a very long period of high unemployment, low output, and very low interest rates,” Carney said. Money managers, however, appear to be unwilling to offload their higher-yielding gilts because they’re worried about generating enough returns to pay their members. The BOE last week failed to find enough investors who were prepared to sell their longer-maturity gilts, a slice of the credit market dominated by pensions and insurers. Companies that run defined-benefit pension funds are also starting to worry. Postal-service operator Royal Mail said last week it may not be able to keep its program running beyond 2018. That’s because its annual contributions could more than double to over £900 million. Stock investors have had one sweet summer so far watching the markets edge higher. With the Standard & Poor’s 500-stock index at record highs and nearing 2,200, what’s not to like? Here’s something. As shares climb, so too do the prices companies are paying to repurchase their stock. And the companies doing so are legion. Through July of this year, United States corporations authorized $391 billion in repurchases, according to an analysis by Birinyi Associates. Although 29% below the dollar amount of such programs last year, that’s still a big number. The buyback beat goes on even as complaints about these deals intensify. Some critics say that top managers who preside over big stock repurchases are failing at one of their most basic tasks: allocating capital so their businesses grow. [..] The net profit test, said Gary Lutin, a former investment banker who heads the forum, “cuts through to the essential logic of comparing a process that grows a bigger pie – reinvestment – to a process that divides a shrunken pie among fewer people: share buybacks. “It’s pretty obvious,” he continued, “that even mediocre returns from reinvesting in the production of goods and services will beat what’s effectively a liquidation plan.” Investors may be dazzled by the earnings-per-share gains that buybacks can achieve, but who really wants to own a company in the process of liquidating itself? Maybe it’s time to ask harder questions of corporate executives about why their companies aren’t deploying their precious resources more effectively elsewhere. And if companies don’t buy stocks, central banks will. It’s the only way left to delay a giant crash. The Bank of Japan’s controversial march to the top of shareholder rankings in the world’s third-largest equity market is picking up pace. Already a top-five owner of 81 companies in Japan’s Nikkei 225 Stock Average, the BOJ is on course to become the No. 1 shareholder in 55 of those firms by the end of next year, according to estimates compiled by Bloomberg from the central bank’s exchange-traded fund holdings. BOJ Governor Haruhiko Kuroda almost doubled his annual ETF buying target last month, adding to an unprecedented campaign to revitalize Japan’s stagnant economy. While bulls have cheered the tailwind from BOJ purchases, opponents say the central bank is artificially inflating equity valuations and undercutting efforts to make public companies more efficient. Traders worry that the monetary authority’s outsized presence will make some shares harder to buy and sell, a phenomenon that led to convulsions in Japan’s government bond market this year. “Only in Japan does the central bank show its face in the stock market this much,” said Masahiro Ichikawa at Sumitomo Mitsui Asset Management. “Investors are asking whether this is really right.” While the BOJ doesn’t acquire individual shares directly, it’s the ultimate buyer of stakes purchased through ETFs. Estimates of the central bank’s underlying holdings can be gleaned from the BOJ’s public records, regulatory filings by companies and ETF managers, and statistics from the Investment Trusts Association of Japan. Forecasts of the BOJ’s future shareholder rankings assume that other major investors keep their positions stable and that policy makers maintain the historical composition of their purchases. [..] Japan’s government bond market offers a guide to the risks of further intervention in stocks, said Akihiro Murakami, the chief quantitative strategist for Japan at Nomura in Tokyo. JGB volatility soared to the highest level since 1999 in April, while trading volume has slumped as the central bank’s holdings swelled to about a third of the market. It’s still buying at an annual rate of 80 trillion yen. “If the BOJ does not sell stocks, then liquidity will disappear,” Murakami said. “As liquidity falls, the number of shares you can buy starts to decline – the same thing that’s happening in the JGB market.” The central bank owned about 60% of Japan’s domestic ETFs at the end of June, according to Investment Trusts Association figures, BOJ disclosures and data compiled by Bloomberg. Based on a report released on Friday by the Investment Trusts Association, that figure rose to about 62% in July. Abenomics is way beyond doubts. Japan’s economic growth ground to a halt in April-June after a stellar expansion in the previous quarter on weak exports and capital expenditure, putting even more pressure on premier Shinzo Abe to come up with policies that produce more sustainable growth. The world’s third-largest economy expanded by an annualized 0.2% in the second quarter, less than a median market forecast for a 0.7% increase and a marked slowdown from a revised 2.0% increase in January-March, Cabinet Office data showed on Monday. The weak reading underscores the challenges policymakers face in putting a sustained end to two decades of deflation with the initial boost from Abe’s stimulus programs, dubbed “Abenomics,” fading. “Overall it looks like the economy is stagnating. Consumer spending is weak, and the reason is low wage gains. There is a lot of uncertainty about overseas economies, and this is holding back capital expenditure,” said Norio Miyagawa, senior economist at Mizuho Securities. “The government has already announced a big stimulus package, so the next question is how the Bank of Japan will respond after its comprehensive policy review, which is sure to lead to a delay in its price target.” On a quarter-on-quarter basis, GDP marked flat growth in April-June, weaker than a median market forecast for a 0.2% rise. Private consumption, which accounts for roughly 60% of GDP, rose 0.2% in April-June, matching a median market forecast but slowing from a 0.7% increase in the previous quarter. Capital expenditure declined 0.4% in April-June after a 0.7% drop in the first quarter, the data showed, suggesting that uncertainty over the global economic outlook and weak domestic markets are keeping firms from boosting spending. That shows companies “are holding all this cash, but investment returns are low and there are few options for projects,” said Liu Dongliang, a senior analyst at China Merchants Bank Co. in Shenzhen. “..If people don’t feel like they are beneficiaries of economic development, if they don’t think their lot in life is improving, that’s when they start getting all kinds of ideas.” We wouldn’t want that, would we? China expects next month’s summit of the G20 which it is hosting will focus on boosting economic growth and other financial issues rather than disputes like the South China Sea, senior officials said on Monday. The summit of the world’s 20 biggest economies in the eastern city of Hangzhou will be the highlight of President Xi Jinping’s diplomatic agenda this year, and the government is keen to ensure it proceeds smoothly. The Sept 4-5 leaders’ meeting comes as clouds continue to hover over global growth prospects and worries about China’s own slowing economy. Last month’s meeting of G20 policymakers was dominated by the impact of Britain’s exit from Europe and fears of rising protectionism. Yi Gang, a vice governor of the People’s Bank of China, said the summit will focus on how to stimulate sluggish global economic growth through open, inclusive trade and the development of robust financial markets. “We need to instil market confidence and ensure there are no competitive devaluations but rather let the market determine exchange rates,” Yi told a news briefing, adding this would be the first G20 to discuss foreign exchange markets in such detail. The G20 will also discuss how to better monitor and respond to risks presented by global capital flows, he said. Despite increasingly protectionist rhetoric around the world, the G20 is strongly opposed to anti-trade and anti-investment sentiment, Vice Finance Minister Zhu Guangyao said. Why the euro is hammering the EU. And will be the end of it. Germany, for example, does not want zero interest rates and those trillions of euros created through ECB’s massive asset purchases. Germany is a fully-employed economy with balanced public finances and an exploding current account surplus of 9% of GDP. With a 1.8% annual growth in the first half of this year, the economy is running almost an entire percentage point above its potential and noninflationary growth. [..] Now, for a sharp contrast, take a look at Italy. On a quarterly basis, there has been virtually no growth in the first half of this year. In fact, the economy has been declining and stagnating over the last four years, and is currently experiencing a price deflation. Italy’s 3 million of unemployed in June (10.6% of the labor force) are only slightly below that level in the same month of last year. A shocking 36.5% of the country’s youth is out of work. [..] Germany, close to one-third of the euro area’s products and services, does not need, and does not want, the ECB’s extraordinarily loose monetary policy. But the hard-pressed economies of France, Italy, Spain, Portugal and Greece – another 50% of the euro area output – need that oxygen to survive. Easy money is all they got. Their budget deficits of 2-5% of GDP, and their rising public debt of 120-185% of GDP, leave no room for fiscal policy to support demand, output and employment. The EU authorities, whoever they are, have relented from imposing penalties on Spain and Portugal – and have looked the other way in the case of France – for transgressing the euro area budget deficit commitments. But they continue to insist on labor market deregulations and on other socially and politically sensitive measures that act as short-term growth and employment killers. Bloomberg editorials blow wherever the wind does. Budget deficits may be coming out of retirement. With economies all over the world growing too slowly and little scope left for new monetary stimulus, governments are turning their attention back to fiscal policy. This shift in thinking is overdue. In many countries, though not all, fiscal expansion is not just possible but also necessary. A resumption of budget activism, if it happens, won’t be riskless, so caution will be needed. A stubborn commitment to fiscal austerity, though, would be riskier still. The immediate response to the 2008 crash included fiscal easing – sometimes deliberate and sometimes the automatic consequence (higher public spending, lower tax revenues) of slumping activity. In most cases, expansionary budgets lessened the impact of collapsing demand, but they also pushed up public debt. In July, the ECB’s chief economist, Peter Praet, said “monetary policy cannot be the only remedy to our current economic challenges.” Governments are responding. Following the U.K.’s decision to quit the EU, the new Chancellor of the Exchequer, Philip Hammond, has promised a break with his predecessor’s approach and says he will “reset” fiscal policy. Added investment in infrastructure is under consideration as part of a new industrial strategy. Blame it on the bubble, not the Brexit. That would be shooting the messenger. London could bear the brunt of a post-Brexit vote downturn, according to economic indicators in the weeks since the EU referendum pointing to job cuts, falling house prices and a decline in business activity in the capital. London’s economy was relatively unaffected by the previous downturn, compared with other UK regions, but early signs from the latest bout of turmoil suggest that it might not get off so lightly again, economists have said. This could have consequences for the government’s tax receipts and overall growth, given the city’s contribution to the UK economy. One key concern about the impact on London of the vote to leave the EU stems from the capital’s dependence on financial services. London could lose its status as Europe’s financial capital if the UK leaves the single market and City banks are stripped of their lucrative EU “passports” that allow them to sell services to the rest of the bloc. Samuel Tombs, the chief UK economist at consultancy Pantheon Macroeconomics, said: “London was unscathed by the last recession, but its dependence on finance now is its achilles heel.” He highlighted a potential change of fortunes for London in a note to clients after surveys showed that companies in the capital had taken a hit from the referendum result. London has been the UK’s growth star for the past two decades, outperforming the rest of the country, Tombs said. “Surveys since the referendum, however, indicate that the capital is at the sharp end of the post-referendum downturn.” added. London was the worst performer out of 12 regions on one measure of business activity for the weeks following 23 June, the day of the referendum. Companies in the capital cut jobs and suffered the sharpest fall in output since early 2009, when the UK was mired in recession, according to the Lloyds Bank regional purchasing managers’ index. Clients appeared reluctant to commit to new contracts, London businesses said, leading to a slump in order books. “The capital was hit harder than any other UK region,” said Paul Evans, the regional director for London at Lloyds commercial banking. How deep a whole will Merkel dig this time around? The EU should grant Turks visa-free travel in October or the migrant deal that involves Turkey stemming the flow of illegal migrants to the bloc should put be put aside, Foreign Minister Mevlut Cavusoglu told a German newspaper. Asked whether hundreds of thousands of refugees in Turkey would head to Europe if the EU did not grant Turks visa freedom from October, he told Bild newspaper’s Monday edition: “I don’t want to talk about the worst case scenario – talks with the EU are continuing but it’s clear that we either apply all treaties at the same time or we put them all aside.” Visa-free access to the EU – the main reward for Ankara’s collaboration in choking off an influx of migrants into Europe – has been subject to delays due to a dispute over Turkish anti-terrorism legislation and Ankara’s crackdown after a failed coup. Wind power has few friends on the political Right. No other industry elicits such protest from the conservative press, Tory backbenchers, and free market economists. The vehemence is odd since wind generates home-made energy and could be considered a ‘patriotic choice’. It dates back to the 1990s and early 2000s when the national wind venture seemed a bottomless pit for taxpayer subsidies. Pre-modern turbines captured trivial amounts of energy. The electrical control systems and gearboxes broke down. Repair costs were prohibitive. Yet as so often with infant industries, early mishaps tell us little. Costs are coming down faster than almost anybody thought possible. As the technology comes of age – akin to gains in US shale fracking – the calculus is starting to vindicate Britain’s vast investment in wind power. The UK is already world leader in offshore wind. 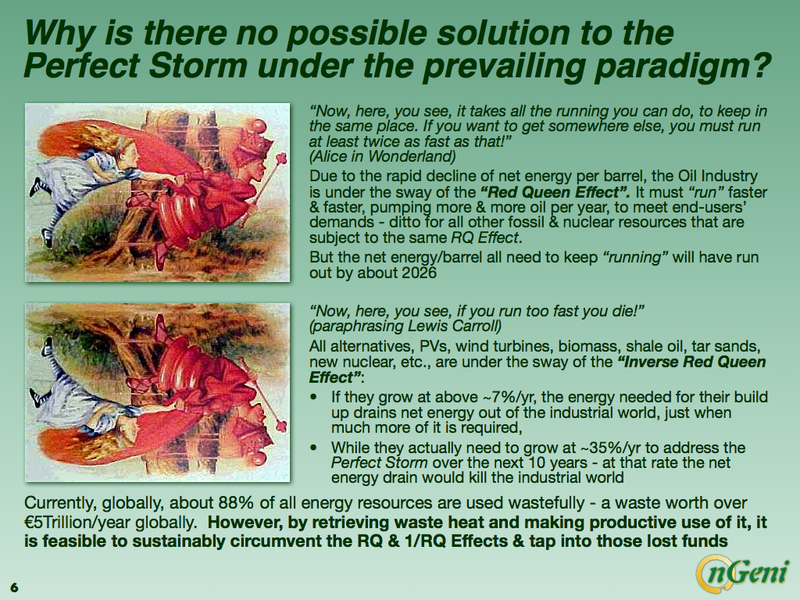 The strategic choice now is whether to go for broke, tripling offshore capacity to 15 gigawatts (GW) by 2030. The decision is doubly-hard because there is no point dabbling in offshore wind. Scale is the crucial factor in slashing costs, so either we do it with conviction or we do not do it all. My own view is that the gamble is worth taking. Shallow British waters to offer optimal sites of 40m depth. The oil and gas industry knows how to operate offshore. Atkins has switched its North Sea skills seamlessly to building substations for wind. JDR in Hartlepool sells submarine cables across the world. Wind power is a natural fit.